How late can you go? Nine’s Live broadcast of The Voice stretched out for 2.5hrs last night, despite having fewer contestants than the previous week. The show was originally advertised to end at 9pm, but an updated EPG indicated 9:19pm. By the time the credits rolled it was around 9:30pm, strategically ensuring Nine kept its audience from switching to the opposition. The show drew in 1.4m viewers as a result, some of which have been fed into 60 Minutes numbers, tallied at 936,000 in preliminary figures (it will be adjusted to a lower number). Nine even codes these episodes as 60 Minutes Late so that its annual average does not drag down other 60 Minutes episodes. All of this was bad news for Seven with Dancing with the Stars dropping to its lowest ever audience at 637,000. But the news was worse for TEN which could not rise above 500,000 without compelling content. ABC and SBS at least enjoyed some sunshine with viewers seeking alternative choices to Reality. 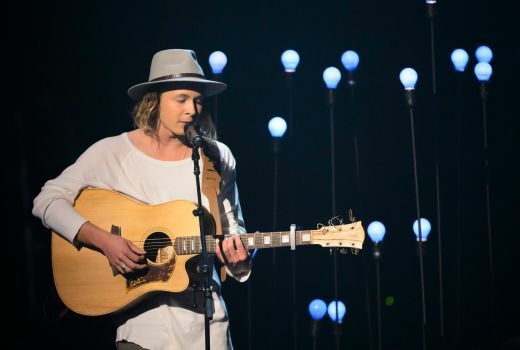 Nine network won the night with 32.6% then Seven 27.8%, ABC 16.2%, TEN 14.6% and SBS 8.7%. The Voice (1.4m) was best for Nine then Nine News (1.29m), 60 Minutes (936,000 in preliminary figures). AD Kingdom & Empire was 351,000 in preliminary figures. Seven News (1.28m) led Seven’s evening then Sunday Night (895,000), Dancing with the Stars (637,000). Bones was just 299,000. Grand Designs drew a big 973,000 for ABC then ABC News (777,000) and The Politician’s Husband (625,000). Silent Witness was 255,000 and Compass was 254,000. Another dud Sunday for TEN, unable to rise above 500,000. Modern Family was 497,000 / 446,000, Gold Coast Cops was 474,000, TEN Eyewitness News was 458,000, CSI Cyber was 407,000, Bondi Rescue was 368,000, and NCIS was 240,000. SBS did well with Uranium: Twisting the Dragon’s Tail at 381,000 followed by Secrets of the Colosseum (352,000), SBS World News (207,000) and Hitler’s People (139,000). 7mate’s Iron Man movie topped multichannels at 262,000. OzTAM Overnights: Sunday 9 August 2015. Has Seven cut an ep of Dancing? Why 2 eliminations? Or will it be a two couple grand finale rather than 3? The show is all over the shop with judges shifting coming and going; little if no reference to the band and singers. It is looking pretty tired. Todd drawing more attention to Matthew’s attempt at realistic falling in love with his dance partner does neither of them any favours. Not sure, but we know there has been a fair bit of scheduling changes at Seven lately. Next week an Immunity episode. It’s turning into Survivor? 7’s Celebrity Survivor Season 2? The Politician’s Husband did OK for the ABC a year after it aired on BBC First., even with BBC First repeating the show against them. I guess BBC Worldwide is making it clear they want the ABC to fork out for exclusive rights but selling rights and then targeting the show seems petty and self defeating. Don’t think the ABC will care, Poldark didn’t rate any better when they had exclusive first rights. They really need to cut the news back to half an hour on Sundays especially For many reasons, but amoung them, 60 minutes is just too heavy a show to be starting at 9.30. I’m a big believer 30 mins is plenty for Sunday (and frankly most nights). I think the production values on Dancing with the Stars is a lot better this year. Instant replays, smoother graphics, etc. But the late timeslot and Shane Bourne’s woeful hosting aren’t helping. Would be better still with the band in view. Less dynamic with its flat backdrop now. Ten would be rating much better if it swapped Bondi Rescue with Spelling Bee. Although Spelling Bee rates well on Monday and Tuesday 7.30pm – it’d be rating over 1m on Sunday at 6.30pm. The earlier timeslot would guarantee a lot more 8 – 12 year olds would be watching with their families – which is what the show is for right? And Bondi Rescue used to rate over 1m when it was on weeknights at 7.30pm. Sadly Modern Family and NCIS repeats don’t cut it anymore. As for CSI – Cyber – well that’s just a dud in Australia. EPG’s are a joke. Your telling me that a live episode of the voice was to supposedly miraculously finish at 9.19pm. Not 9.20 pm or 9.30pm when it did actually finish. I actually flipped on 9 around 9pm to watch 60 minutes to see the mh370 story which was when 60 minutes was originally scheduled to start but had a late change to 9.19pm. Have hardly watched 60 minutes this year due to the late air time and after last nights epg shenanigans won’t be making that mistake again. As for what Sonia and Jessie J were wearing, what were channel 9 wardrobe thinking? Did they have any influence of their outfit choices? Yes, they both looked ridiculous. What was that light coloured strip half hanging off Sonia’s shoulder?? Looked like she had been packing boxes and accidently got masking tape stuck to her dress. i sometime wonder just how live some segments are… especially now people can and do periscope from the studio…. i remember in the days of Australian idol this use to happen all the time, but i haven’t seen a live reality show run this overtime in years, too bad for those wanting to watch 60 minutes. Dreadful night for TEN, single digits for a primary channel on a Sunday. Ideally they’d have a new stripped format to put there, but it’s just too risky for them at the moment, look at Restaurant Revolution. Seven had DWTS performing quite well as end of year filler against softer competition. Why they thought a show in its 15th season would suddenly be able to compete again on a Sunday night mid-year is quite baffling. I don’t think starting it at 8pm is helping it either. People know it’s a long show and will stretch past 10pm. I also don’t think Shane Bourne has really settled in that well to the hosting job. Lack of alternatives. Nine used Reno Rumble to nullify House Rules and push The Voice on later to cover for the absence of BB. Seven has been scrambling ever since.